On the way to our cruise aboard Royal Caribbean’s Allure of the Seas, we were stuck in the Baltimore-Washington International Airport for a long time because our connecting flight was delayed. We arrived there at 8pm and didn’t take off until 1:20am; we were supposed to take off at 9:45pm. Weather was the excuse the people at the counter cited, but all reports on the TVs in the station indicated weather along the east coast was fine. Whatever. At that point, what was I gonna do? I couldn’t drive home or anything. So we decided to sit down for dinner in the airport. I was excited about the cluster of fast food places in the terminal. There was Arby’s, McDonalds, Quiznos, Charlie Chang’s Kwai (looked like mall food court Chinese), and California Tortilla (something like Chipotle) right in a row. When it comes to fast food, I can appreciate a meal at any of them, taken for what it’s worth. We also passed a diner that looked kind of fun, so that’s actually where we ate. The Silver Diner is a 50s style diner that’s inside of concourse B. It was also a very interesting restaurant. It was interesting from the perspective of how they market themselves. 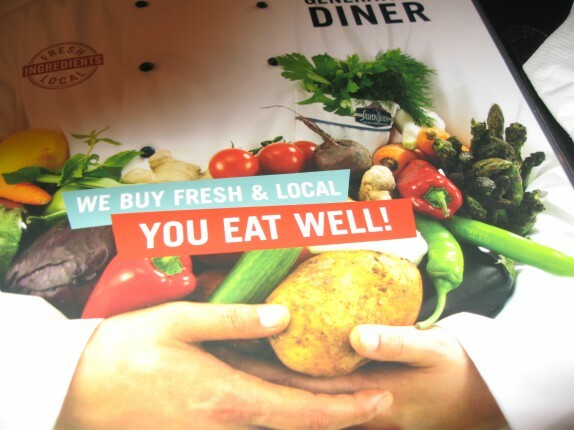 Like many smart restaurants, the Silver Diner is very committed to local ingredients fresh from the farms. This is the first diner I’ve seen with these types of values. When I think of a diner, I think of a kitchen with a short order cook standing next to a 3 foot stack of run-of-the-mill eggs making omelettes stuffed with American cheese on a flat top all day. I don’t think of opening the menu and seeing a list of where they source their ingredients. 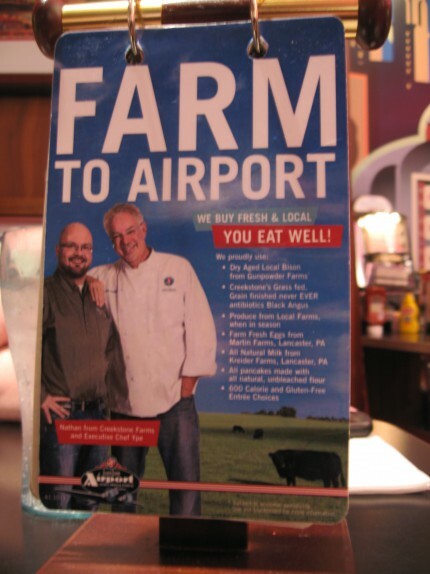 To me, this was pretty damn cool, even though the last thing I think about when I think of an airport is local ingredients. There were some pretty interesting things on the menu, and they serve breakfast all day, so it was tough to not get pancakes for dinner. But, I set my mind to deciding on a burger. The place is laid out with booths and tables just like any diner. Even the decor and jukeboxes at every table is reminiscent of a 50s diner. The one thing they didn’t account for when they built this place was that pretty much everyone eating there would be schlepping around their carry-on luggage. Ours sat next to our table and the servers seemed to be used to maneuvering around them. Our server was a piece of work. He was very nice, and he actually made a comment about how amazing the nWo used to be back in the day once he saw my t-shirt. That’s always fun. He also had interesting disposition. When he wanted to refill our sugar packet container, which was pretty close to already full, he spoke directly at Cassie’s friend and said, “Excuse me; can you please do me a favor and hand me that sugar container?” It was borderline awkward (I guess you had to be there to appreciate the exchange), but he was very accommodating, and that’s what’s important. Because it’s an airport, he made sure to ask us if we were in a hurry, and I liked that as well. It was very reassuring that we could have a leisurely dinner while not inconveniencing other diners who may have been in a hurry. 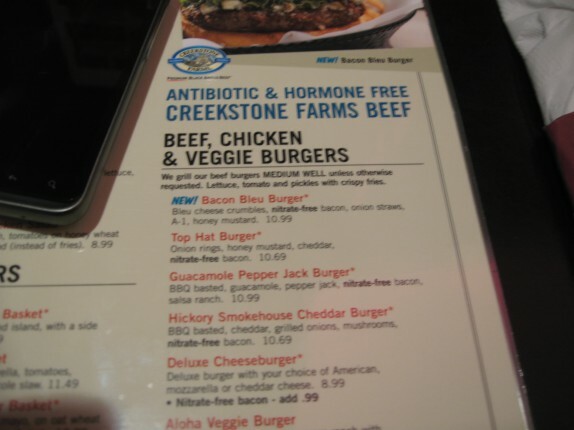 I ordered the bacon bleu burger (Bleu cheese crumbles, nitrate-free bacon, onion straws, A-1, honey mustard – $10.99). It seems like quite a bit to spend on a burger in an airport, but you have to realize you’re not just paying for their overhead for being in an airport; you’re also paying for their ethics. But ethical, non-ethical, who cares? How did it taste? The burger was really good. The menu specifies that all burgers would be cooked medium well unless otherwise noted, so I didn’t want to argue with that. I figure they say that for a reason. It came out medium well. 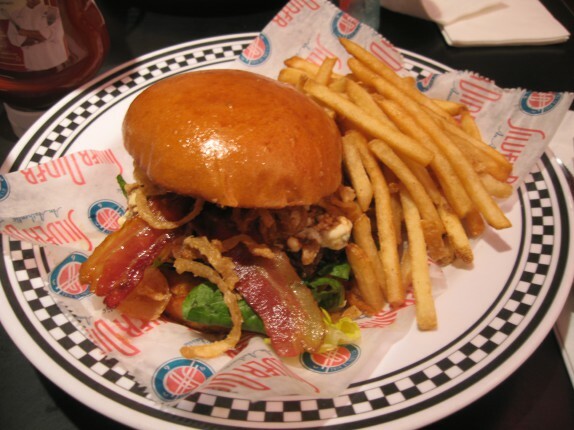 It had your standard two slices of bacon per burger, and it was clear that they do a bunch of bacon in advance and rewarm it on the flat top, but it was pretty good bacon. It tasted mild for bacon, honestly. The blue cheese, A-1, and honey mustard were not applied evenly, so there were some bites that were heavy in each. I love onion straws on a burger, and theirs weren’t bad at all. The fries were soggy and a little miserable. Eaten with some of the high fructose corn syrup free ketchup, they weren’t terrible. It was a very positive experience in an airport, and the meal, shared with Cassie and friends, really helped to lift our spirits after finding out about our delay. Walking to our terminal, we saw the coolest thing. 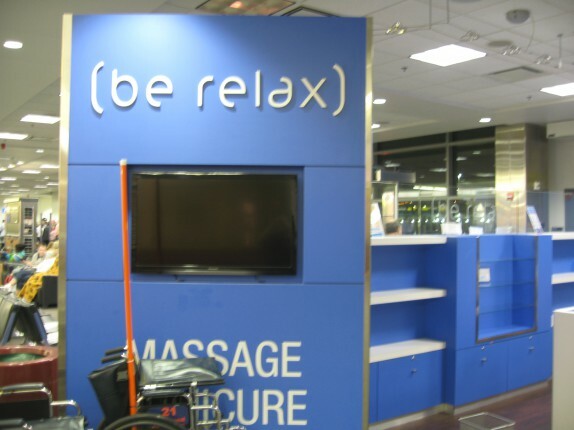 It’s a stand right in the middle of the concourse that does massages, pedicures, manicures, and possibly other spa services. It was the weirdest thing ever, but it was fun to find out it was there. Instead of opting into one of these things, I just sat down at a chair and waited for the plane to arrive. Ohh, and I obsessed over the Best Buy Express kiosks I kept walking past. A tech toy vending machine sounds pretty amazing to me. 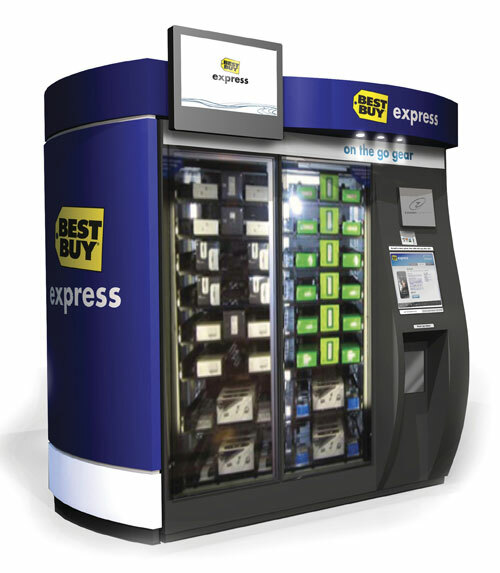 I was quite taken with the Best Buy Express vending machines on my last trip. I wanted to buy something just to watch the precious touch screen device topple off the top shelf and land with a thud at the bottom!